England manager Martin Johnson has added an honorary degree to his list of accolades. 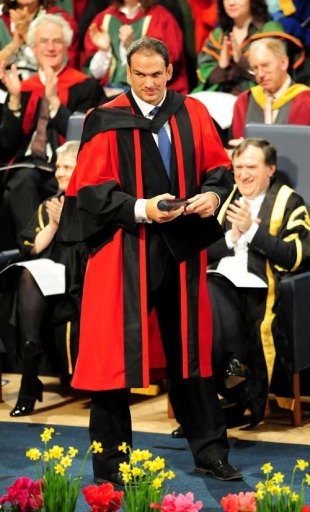 The Leicester legend and England's World Cup-winning captain was awarded the honorary degree of Doctor of Laws by the University of Leicester at a ceremony in the city's De Montfort Hall. Johnson's England will begin their Six Nations campaign against Wales on February 6 but the former lock took time out to accept the award and joke with the audience about the irony of his "rather chequered career" in relation to becoming a Doctor of Laws. "I do also see the irony of Doctor of Laws and the amount of times I've broken the laws of the game and the union that I played for during my rather chequered career," he said. "I'm deeply proud of the county and the city and when you receive awards after you've achieved something, it's just fantastic to be here at Leicester and to receive this award from my hometown, and my home city, so I thank you again for that. "I'd just like to congratulate everyone here who's worked incredibly hard to receive their award. I feel a little bit false to be sat there when you guys have all put years of hard work into getting here and I get something but I am very grateful and honoured to receive that award."